Let’s Eat Outdoors - A masterpiece. Not your average cookout cookbook, “Let’s Eat Outdoors” is a mid-’50s fantasy of outdoor eating from the rugged to the refined. Look for some of the bluest blue chips of packaged goods brands and some of the most clever and creative recipes – all set against a backdrop of first-rate ’50s advertising design and copy. Publication date: mid-1950s. Heinz Magic of Food Show - “Any sufficiently advanced technology is indistinguishable from magic.” So said futurist and science fiction author Arthur C Clarke. And the 1964-65 New York World’s Fair was chock full of advanced technologies. 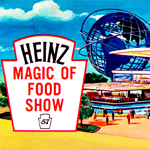 Visitors marveled at GM’s Futurama , IBM’s puppet show about computers, DuPoint’s “Happy Plastic Family” that ushered them into the “Wonderful World of Chemistry” (listen to the song) and, perhaps most astonishing of all…the “Heinz Magic of Food Show” booklet. New! Cheez Whiz - In the beginning there was darkness. But then the good folks in the Kraft Kitchen said, “let there be Cheez Whiz” and the world was bathed in the glorious golden glow of New! Cheez Whiz. Publication Date: 1953. Tuna - This could save your life. In addition to recipes including Avacodo Tuna Mold, Mackerel Loaf and Sardine Cheese Spread, you’ll find salty seamanship tips including, boating rules of the road, knot tying and the complete International Morse Code (which was recently retired from actual maritime use). GREAT line art, fish images and product illustrations. Estimated publication date: Early ’50s.